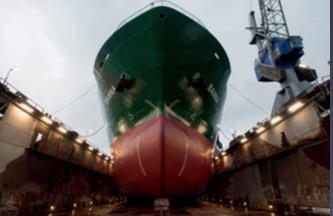 China’s Qingshan Shipyard has delivered AP Revelin, the second in a series of two environmentally sustainable Handysize bulk carriers, to Croatia-based shipping company Atlantska Plovidba d.d. from Dubrovnik. The 38,700dwt ‘ecoship’ will join first of class AP Dubrava, which was delivered in July 2015. Each 180m (591ft)-long tramp trader, built to the Green Dolphin 38 design unveiled by Shanghai Merchant Ship Design & Research Institute (SDARI) in 2012, features Thordon Bearings’ seawater-lubricated COMPAC propeller shaft bearing system and a Thordon Water Quality Package (WQP). This will provide a clean and consistent supply of seawater to the bearings even when the vessel is docked downstream of the current in shallow waters. Matana revealed that a conventional white metal bearing for use with an environmentally acceptable lubricant had been considered but an unproven track record prevented their take-up. “I have worked with Thordon Bearings and its Croatian distributor Skoring for more than 20 years and have a lot of experience with Thordon’s SXL rudder bearings, which have a perfect track record. A single source for the design, product quality and installation support was deemed essential to ensuring the COMPAC system will perform as required and keep my vessels on the high seas,” Matana added. The Green Dolphin bulk carrier concept was introduced during the Posidonia Exhibition in 2012 following a joint research project between SDARI, Det Norske Veritas (DNV) and Wa¨rtsila¨. It features a hull form and machinery configuration designed to optimize fuel consumption and reduce emissions. AP Dubrava, the first vessel in the series, has been operating ‘perfectly’ for six months and is now on duty in the Black Sea. Vessel options are being considered. A global leader in seawater lubricated propeller shaft bearing systems with over 25 years’ experience in this technology, Thordon Bearings designs and manufactures a complete range of non-metallic sleeve bearing solutions for marine, clean power generation, pump, offshore oil, and other industrial markets. The polymer bearings operate pollution free without oil or grease. Thordon Bearings is the only manufacturer of propeller shaft bearings to guarantee its award-winning COMPAC system for a 15-year wear life. Established in 1955, Dubrovnik-based Atlantska Plovidba d.d. operates a fleet of 17 modern bulk carriers and is committed to meeting the demands and expectations of national and international charterers. The company operates to quality, environment and safety management policies and procedures required by ISO 9001:2008, ISO and the ISM Code for the Safe Operation of Ships and Pollution Prevention.